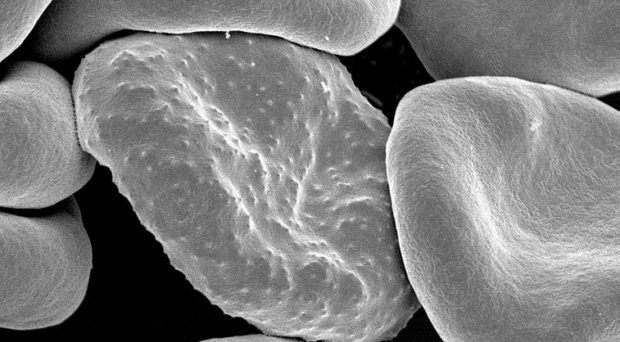 One feature of the most virulent species of malaria parasite, Plasmodium falciparum, is its ability to make infected red blood cells stick to the endothelial cells lining blood vessels, including those serving the brain. This process, known as cytoadherence, has been associated with the development of the severe symptoms of the disease known as cerebral malaria. Cerebral malaria is defined by the symptoms of unrousable coma and the presence of parasitized red blood cells. Although only 1% of infected people display these symptoms, 90% of these are children. Those that survive suffer from neurological problems. Cerebral malaria can occur together with multiple organ failure and, if left untreated, can lead to death within hours. Although the causes of cerebral malaria are not clear, and are likely to be multiple, it is associated with sequestration of infected red blood cells (iRBCs) in the small blood vessels of the brain. This leads to microvascular obstruction and a deficiency in the amount of oxygen reaching the tissues. Several molecules of parasite origin have been identified as being involved in cytoadherence. They are exported to the surface of iRBCs, gathered in protrusions called knobs, and bind to adhesion molecules expressed on the surface of endothelial cells. This binding has been found to activate the Rho kinase signalling pathway via the Rho kinases, a family of small GTPases that act as molecular switches. This activation can trigger changes in the endothelial cells, affecting the blood-brain barrier. Several studies suggest that treatments that reverse cytoadherence could be life-saving, including the use of a monoclonal antibody therapy to block ligand-receptor interactions. A protein toxin from Escherichia coli, cytotoxic necrotizing factor 1 (CNF1), is known to modulate the activity of some of the Rho GTPases family, locking them in an activated state which triggers their degradation. CNF1 also protects against apoptosis and alters the cell actin cytoskeleton. In a recent publication, Valeria Messina, Stephano Loizzo and colleagues report their investigation of the potential use of CNF1 as an inhibitor of the adhesion of iRBCs to endothelial cells. When co-cultured with endothelial cells, iRBCs adhere to their surface, providing an in vitro model for investigation of cytoadherence. Using two clones of P. falciparum and two sources of endothelial cells, the researchers demonstrated that pre-treatment with CNF1 significantly reduced adhesion in all combinations of clone and endothelial cell line. In addition, post-treatment of iRBCs / endothelial cell cultures with CNF1 caused a significant reduction in the number of iRBCs adhering to the cell lines. They had demonstrated that CNF1 not only prevents cytoadherence, it can also reverse it. ICAM-1 is one of the endothelial cell receptors to which iRBCs bind. iRBCs will bind to ICAM1 that has been spotted onto plastic Petri dishes. By performing these binding assays, with and without CNF1, the investigators showed that CNF1 did not act by interfering with the binding of iRBCs to ICAM1. Further experiments showed that CNF1 is not toxic to the parasite, nor did it affect the expression of knobs on the iRBC surface. CNF1 did decrease the expression of ICAM1 by endothelial cells. But, this only occurred at 24h of treatment, after the parasite had detached, suggesting this was not its mode of action. CNF1 did, however, affect the integrity of the endothelial layer and its ability to act as a barrier. The blood-brain barrier is maintained by the integrity of the endothelial cell barrier. Hyperpermeability of this endothelium is part of the pathology associated with cerebral malaria. Experiments showed that the presence of iRBCs increased the permeability of an endothelial cell layer. This could be prevented if CNF1 was added to the culture before iRBCs were introduced, and reversed if added once they had already adhered to the layer. Thus, CNF1 was acting on endothelial cells, not the parasite or iRBC. Although endothelial cell viability was not affected by CNF1, it did change their morphology, causing the cells to flatten and spread. The actin cytoskeleton was also reorganised and enriched. These cytoskeletal changes are under the control of Rho GTPase family members. The activity of these proteins was shown to be increased by the presence of CNF1, with one in particular (Cdc42 GTPase) increased 76-fold. Furthermore, the use of inhibitors demonstrated that cytoadherence is unaffected by CNF1 if Rho kinases are inhibited and CNF1 is also unable to activate the reshaping of the cytoskeleton if Rho GTPases are inhibited. The authors concluded that the ability of CNF1 to activate Rho GTPase subfamily members initiates a cascade of events affecting endothelial cell morphology, cytoadherence and possibly ICAM-1 downregulation. They suggest that, used as a therapy, CNF1 could initiate the detachment of iRBCs from endothelial cells, preventing or unblocking microvascular flow. This, together with its known ability to counteract neuroinflammation and its rapid action, points to its potential attractiveness as a single-dose drug for complications due to cerebral malaria. An added benefit arises as it is the endothelial cells that are targeted, not the parasite, therefore parasite drug resistance would not develop.